The legal minimum depth of the main grooves of a car, van and trailers up to 3500kg in weight is 1.6mm. This applies across the central three quarters of the breadth of tread and round the entire outer circumference of the tyre. But don't wait until you get to the legal minimum, Feltham Tyre Centre would recommend tyres are changed at a minimum of 2mm preferably 3mm. Correct tyre pressures are vital for safe handling and optimum braking, grip and tyre life. Wrong Tyre Pressures (high or low) will cause more rapid wear and shorten tyre life. Low Tyre Pressures: Under inflation is one of the leading causes of tyre failure. It can result in unnecessary tyre stress, irregular wear and possible loss of vehicle control, not only that, under inflation will increase fuel consumption. High Tyre Pressures: Over inflation is also highly undesirable with risk from tyre blow out, may cause reduced comfort, and reduced stability in braking and cornering. Pressures should be checked at least every two weeks and only when the tyres are cold. Accurate and reliable gauges are not expensive and will soon pay back their cost. Safety is the main reason for balancing the wheels and tyres on your vehicle. Balancing will help ensure a smooth vibration free ride as well as improving tyre life. When the wheels on your car have an imbalance, the most notable effect is that the steering wheel will vibrate in your hands or the seat vibrates. As tyre and wheel assembly is vibrating the contact pressure of the tyre on the road varies, which can cause irregular wear and will in turn result in premature tyre removal. The wheels should be balanced when new tyres are fitted, any time that the tyre is removed from the aim and at regular intervals to take into account any variation in tyre balance from irregular wear. Correct alignment is critical to safety controlling your vehicle, braking stability, extending tyre life and ensuring a comfortable ride. It is extramely important that your vehicle's front wheels are aligned to the rear wheels, and where possible all four wheels should be aligned. Your vehicle pulls or drifts to one side when travelling in a straight line or when braking. Your steering wheel is not straight when driving on a level road. You hear unusual noises in your suspension system. The vehicle wanders from one side of a lane to another. Tyres are squealing on turns. The steering wheel does not return easily after a turn. Your tyres are wearing unevenly. The rear silencer is the part of the exhaust that usually requires attention first. The reason for this is it is the furthest away from the engine and is most likely to be corroded by acidic moisture. You will know you have a problem because your exhaust starts making a roaring noise, other noises to listen for include hissing, which indicates a cracking in the exhaust manifold, exhaust pipe or leaking gasket. Catalytic Converters (cats for short) are now fitted to all cars to remove harmful pollution from the exhaust gases. It is an integral part of the engine performance system and sensors control the gases enteringand leaving the cat are controlled by the engine management system. Cats are easily damaged by hitting solid engine can cause the cat to work ineffectively requiring replacement. There are severe penalties for offences relatingto the use of faulty tyres on vehicles. In the case of any vehicle, except goods vehicles for every offence there is a fine at level 4 of the standard scale with dsicretionary desqualification and compulsory driving licence endorsement with 3 penalty points. Level 4 is currently £2,500 and each faulty tyre is considered a seperate offence. Two faulty tyres equal £5,000. Inflation: a tyre not inflated to make it suitable for the purpose to which the motor vehicle or trailer is being put. Unsuitability: regarding the use to which the motor vehicle or trailer is being put to the types of tyres fitted to its other wheels. We would recommend keeping your tyres in optimum conditions by following these simple rules. Check the pressure of your tyres when they are cold. 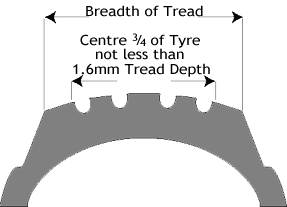 Check the tread depth of your tyres. Legal minimum is 1.6mm. Check your tyres for damage. look for any cuts, cracks or bulges. Check the pressure and tread depth of your spare tyre.